multiplayer, role-playing games. Instead of continuing to follow the quest structure of the game (killing dragons, getting better equipment, joining more competitive guilds, etc.) 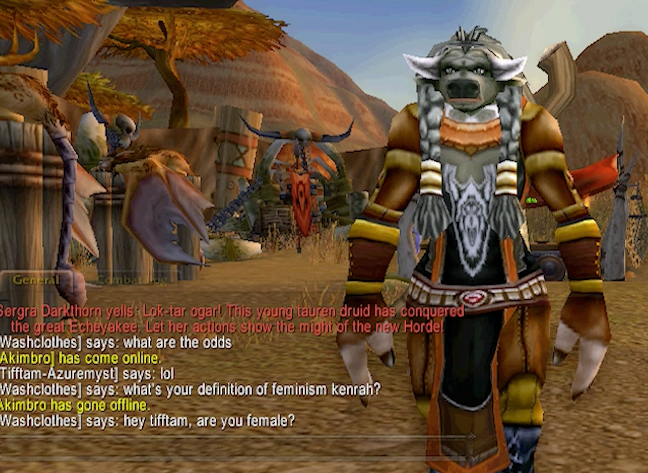 and while performing as “The Council on Gender Sensitivity and Behavioral Awareness in World of Warcraft,” Washko facilitates discussions with players inside the game about the ways in which the community therein addresses women and how players respond to the term “FEMINISM.” Washko is interested in the impulse of the community/player-base to create a somewhat oppressive, misogynistic space for women within a physical environment that is otherwise accessible and inviting. 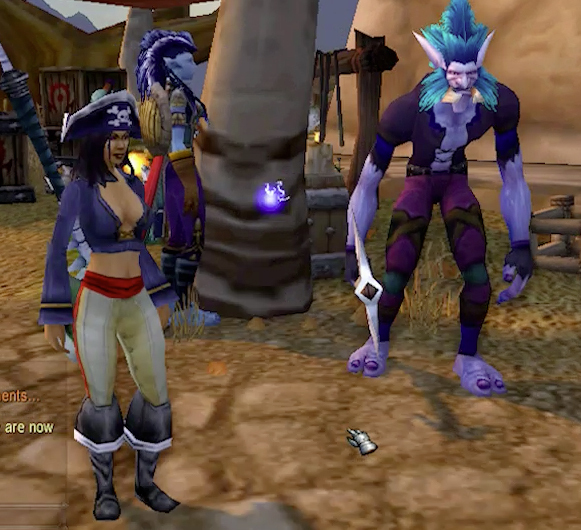 Furthermore, WoW is a geographically, politically, economically, socially, and racially diverse community (a much more varied community to engage with than she has in physical public space). Consequently, these discussions within the game space create a much larger picture of the American opinion of the evolving role of women in contemporary society. Angela Washko is a performance and video artist creating new forums for discussions of feminism where they do not exist. Her practice is research-based, employing data as a storytelling tool to create prototypes for actions by others. “Misusing” software, Washko attempts to intervene on public opinion regarding proper etiquette, appropriate lifestyle choices, and limited gender designations. 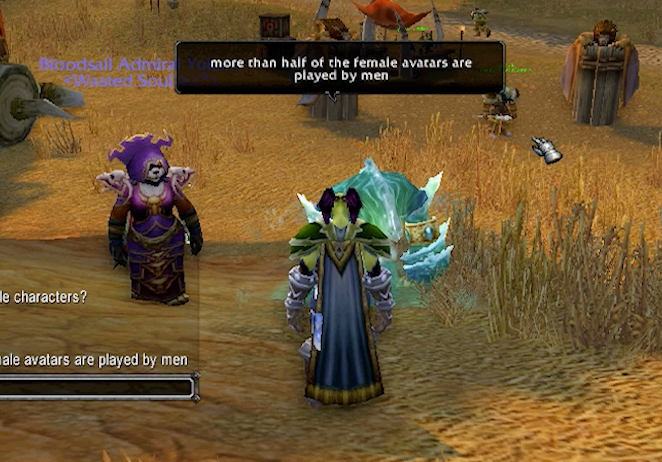 In 2012, Washko founded The Council on Gender Sensitivity and Behavioral Awareness in World of Warcraft as an ongoing intervention on communal language formation inside the most popular online multiplayer role playing game of all time. Additionally, she created an archive of digi-feminist practices called Out of The Kitchen Archive as well as a radio show called A CUPS in collaboration with Ann Hirsch. Washko is currently working on a public access TV show and performance persona around data sets she’s extracted from Bravo TV’s “Millionaire Matchmaker” and searching for women who have slept with notorious pick up artist Roosh V.
A recent recipient of a Creative Time Report commission, The Franklin Furnace Performance Fund Grant, a Rhizome Internet Art Microgrant, a Danish International Visiting Artist Grant and the Terminal Award, Washko’s practice has been highlighted in Time Magazine, The Guardian (UK), ARTnews, VICE, Hyperallergic, Rhizome, the New York Times, The Creator’s Project, Dazed and Confused Magazine, Digicult, ArtInfo, Bad At Sports, and more. Her projects have been presented nationally and internationally at venues including Kiasma Museum of Contemporary Art (Helsinki, Finland), MOD: Monitor Digital (Guadalajara, Mexico), Moving Image Art Fair (London and NYC), K11 Concepts (Shanghai, China), Interaccess (Toronto, Canada), the Rotterdam International Film Festival, Institute for Contemporary Art Boston and Foundation Vasarely (Aix-en-Provence, France) to name a few.